NASA's Kepler mission, the Earth-like planet hunter, successfully launched on March 6, 2009. Just over a month later, and the spacecraft has taken its first images of the star-rich sky where it will soon begin searching for extra-solar planets similar to Earth. 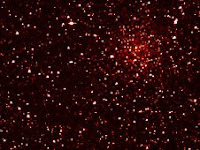 The image on the right is one of the "first light" images showing the mission's target patch of sky, a vast starry field in the Cygnus-Lyra region of the Milky Way galaxy. This image shows its entire field of view, a 100-square-degree portion of the sky. The region contains an estimated 4.5 million stars, more than 100,000 of which were selected as ideal candidates for planet hunting. "Everything about Kepler has been optimized to find Earth-like planets," said James Fanson, Kepler's project manager at JPL. "Our images are road maps that will allow us, in a few years, to point to a star and say a world like ours is there." The Kepler mission has a wonderful project website at: http://kepler.nasa.gov/. The website features an excellent collection of learning activities for children grades K-12, and beyond. Kepler activites are thought provoking exercises for hours of science family fun. Welcome to the Science Lifestyle Blog!